IT'S FRIDAY! Although the Team behind the screens here at Minerva HQ will be beavering away over the weekend we still have cause to celebrate; not only because we have the best jobs in the world (clearly) but it's also Fabric Friday! I thought this week I'd shine light on the brightest range of fabrics we carry here at Minerva - our Dancewear Fabrics! Now Lycra and other such fabrics may strike fear into the hearts of many, particularly if you grew up in the era of Home Exercise Videos, but it is a surprisingly versatile range of fabric! Our Hologram Floral Print Stretch Jersey is pretty darn nifty if you ask me. I really like the idea of foil print fabrics as they add a dimension of depth with the way the garment would catch the light, particularly on a jersey which would have a flow and drape to it! If you're going to be sewing with any of these, or any stretch fabric really, you can utilise the opportunity to use the Seraflock Stretch Thread! So that's my Fabric Friday, a little list of fabrics that've jumped out at me this week. Be sure to keep your eye out for Halloween posts, too! Sirdar Noah's Ark Knit Along Part 3 - Giraffes! rep repeat, st(s) stitch(es), tog together, tbl through back of loop. st-st (Stocking Stitch) 1st Row. Knit. 2nd Row. Purl. Rep these 2 rows. Next Row. K2tog, knit to last 2sts, k2tog. 28 sts. Rep from * once more. 26 sts. Work 5 rows without shaping. Next Row. K2tog, knit to last 2 sts, k2tog. 24 sts. Rep last 6 rows 7 times more. 10 sts. Work 3 rows without shaping. Break off yarn and thread through rem sts and fasten off. MAKE UP Using C, Swiss embroider random spots as chart. Join side edges of Back and Front and stuff. Next Row. Inc in every st to last st, k1. 27 sts. Work 3 rows without shaping. Next Row. (K1, inc in next st) 13 times, k1. 40 sts. Work 5 rows without shaping. Next Row. K2, (k2tog, k3) 7 times, k2tog, k1. 32 sts. Work 3 rows without shaping. Next Row. K1, (k2tog, k2) 7 times, k2tog, k1. 24 sts. Work 5 rows without shaping. Next Row. K3, (k2tog, k1) 6 times, k3. 18 sts. Next Row. Purl. Change to C, Next Row. K3, * m1, k2, rep from * to last 3 sts, k3. 24 sts. Next Row. (K2tog) 12 times. 12 sts. (Make 2) Using C cast on 14 sts. Next Row. Inc in 1st st, knit to last st, inc in next st. 16 sts. Next Row. Inc in 1st st, purl to last st, inc in next st. 18 sts. Next Row. K7, (inc in next st) 4 times, k7. 22 sts. 1st Row. K8, k2togtbl, k2, k2tog, k8. 20 sts. 3rd Row. K7, k2togtbl, k2, k2tog, k7. 18 sts. 5th Row. K6, k2togtbl, k2, k2tog, k6. 16 sts. 7th Row. K5, k2togtbl, k2, k2tog, k5. 14 sts. Work 18 rows in st-st.
Next Row. K4, (m1, k1) 6 times, m1, k4. 21 sts. Beg with a purl row work 5 rows in st-st.
Next Row. K4, (k2tog) 7 times, k3. 14 sts. Beg with a purl row, work 23 rows in st-st.
Sew base of hoof and side edges of leg together, stuffing as you work along. Roll a round piece of stuffing to give the knee section definition. (Make 2) Using M cast on 20 sts. Next Row. (K2tog) 10 times. 10 sts. Fold ear in half and sew side edges together. (Make 2) Using C cast on 7 sts. Next Row. (K1, m1) 6 times, k1. 13 sts. Next Row. (P2tog) 6 times, p1. 7 sts. Roll side edges of work to form horn shape and sew in place to keep the shape firm. (Make 2) Using M cast on 12 sts. Working in st-st (throughout) work 38 rows. Sew side edges of arm together stuffing as you work along. Using M cast on 16 sts. Next Row. Inc in 1st st, knit to last st, inc in last st. 18 sts. Next Row. Inc in 1st st, knit to last st, inc in last st. 20 sts. Next Row. Inc in 1st st, purl to last st, inc in last st. 22 sts. Next Row. Inc in 1st st, knit to last st, inc in last st. 24 sts. Beg with a purl row work 6 rows without shaping in st-st.
Next Row. K2tog, knit to last 2 sts, k2tog. 20 sts. Next Row. P2tog, purl to last 2 sts, p2tog. 18 sts. Next Row. K2tog, knit to last 2 sts, k2tog. 16 sts. Sew base to cast on edges of Back and Front placing legs to front cast off edge of base. Sew head firmly to gathered neck edge. Sew arms 6cm down from neck. Sew horns to centre back of head just above back head seam. Fold ears in half at cast on edge to form a pleat, sew ears 1cm forward of horns and to side edges of head. Using colour of your choice embroider eyes working a French knot with a straight stitch to the top and bottom of the knot. Make 2 small straight stitches in the nose section to indicate nostrils. Cut 8 lengths of M 40cm long to make a twisted cord tail. Make a knot leaving a 3cm fringe and cut across straight. Our Pattern of the Week is a WOW as well as a POW! Look at that! 4 Bodices, 2 Midriffs, 4 Skirts and a Flower in one sewing pattern. It' like a GCSE Maths Exam Question! Though don't fret, we've done the working out, 64. 64 different dress combinations! This teamed with recommended fabrics of Satin and Crepe, Sheer Fabrics for the Draping Bodices, and Tulle for the huge skirt, gives you the chance to create something truly special. If you want to recreate this astounding garment our Bridal Tulle is amazing for many reasons. For me though its amazing elegance and 108" width make it a winner. Match with our Shimmer Crepe for a stunning evening dress. If you fancy an 80s throw back, try the Puff Ball variation as a chance to play with some amazing Sheer Fabric! Our Floral Ribbon Embroidered Georgette Dress Fabric is begging to be teamed with this voluminous addition and the bright colour choices are the cherry on the cake for the big impact of this dress! What about the seemingly boring straight skirt? Wondering how to use the flower embellishment? From this sketch, less certainly isn't more! Most certainly an excuse to experiment with Sheer Border Fabrics to mirror the detail of the bodice! At just £4.38 this week, this is another great way to get adventurous! As always, share your makes! With Halloween just around the corner this week is taking a Spooky theme! WARNING - This post contains terrifyingly bad puns! ...or Ghastly Ghosts to create a Spook-tacular outfit! I really like the idea of teachers making this up into a garment and wearing it at School discos! Also, great for parents wanting to get into the spirit of things! Available is a wide range of colours, this fabric is perfect for making costumes, or backdrops to ghoulish gatherings! Great for anyone wanting to make an impact but not breaking the bank. A customer brought this to our attention with an idea to team our Gothic Skulls Design Nylon Lace with a lining fabric for a Spooky Ghost with a twist! Simply, but better than just a bed sheet! I think this fabric would top off any Ghastly outfits, as the edges look like they're coated is ash or dust, adding the fiendish final touch to your outfit. So that's my Five Fiendish Favourites for the First Fabric Friday! Be sure you keep your eye on the blog for more Halloween Inspiration! After casting off, one stitch will remain on the right hand needle which is not included in the instructions that follow. K2tog – knit two sts together. 1 pair of 4mm (UK 8, US 6) needles, Large sewing needle and 1 ball each of Stylecraft Special DK in Black and Cream. 2 buttons. Using 4mm needles and cream cast on 46sts. Next row (RS): Knit. Rep last row 5 times more (6 rows in total) Cont in st-st for 20 rows. Next row: Knit. Rep last row 5 times more (6 rows in total) Cast off loosely. Button loops - Using a crochet hook make a chain to length needed. Tie off and secure. Sew up seam. Using photographs as a guide, using correct coloured yarns doubled up embroider features on cosy. Sew on buttons and button loops. 1 pair of 4mm (UK 8, US 6) needles, Large sewing needle and 1 ball each of Stylecraft Special DK in Black, Lime, Fondant and Cream. 2 buttons. Tension 22sts X 30rows on 4mm needles. Using Black, Knit as for Ghost. Cat ears Using 4mm needles , cast on 10sts. Next row: K4, K2tog, K4. Cont to Knit, dec 1 st in middle of work until 1 st rem. Secure last st. Sew up seam. 1 pair of 4mm (UK 8, US 6) needles, Large sewing needle and 1 ball of each Stylecraft Special DK in Black, Lime and cream. Using 4mm needles and M yarn, cast on 46sts. Next Row (RS): Knit. Rep last row 5 times more (6rows in total) Cont in st-st for 16 rows. Next row: K4 in CS, K6 in MS, K3 in CS, K4 in MS, K6 in CS, K4 in MS, K3 in CS, K6 in MS, K4 in CS, K3 in MS, K3 in CS. Next row: P3 in CS, P3 in MS, P4 in CS, P6 in MS, K3 in CS, P4 in MS, P6 in CS, P4 in MS, P3 in CS, P6 in MS, P4 in CS. Rep last 2 rows once more. Using CS yarn, knit one row. Rep last row 5 times more (6 rows in total) Cast off loosely. You will need – 1 pair of 4mm (UK 8, US 6) needles, Large sewing needle and 1 ball each of Stylecraft Special DK in Spice and Black. 2 buttons. Using Spice, knit as for Ghost. You will need – 1 pair of 4mm (UK 8, US 6) needles, Large sewing needle and 2 ball of Stylecraft Special Dk in Spice and 1 ball of Lime. Using 4mm needles, cast on 47 sts. Row 1: K1, *K2, P2; rep from * to last 2 sts, K2. rep from * to last st, K1. Rep rows 1 & 2 until 45 rows are complete. Next row: P3tog, *K1, P3tog; rep from * to end. K1. 23sts. Next row: K2tog to last st. K1. 12sts. Thread yarn through rem sts and secure tightly. Using 4mm needles, cast on 2sts. Next row: K1, inc 1 st in middle of row K1. cont to knit every row inc 1 st in middle of work until 10sts. Next row: Knit. Next Row: K4, K2tog, K4. Cont to Knit, dec 1 st in middle of work until 3 st rem, K3tog. Using 4mm needles, cast on 3sts. Next row: slip sts onto left hand needle and Knit. Rep last 2 rows 4 times more. Place both pieces together; sew side seams at the top and bottom leaving an appropriate gap for the spout and handle. Stitch leaves and stalk to gathered top edge. It's Pattern of the Week time! This week features a perfect pattern for those looking to venture in to making party Dresses! Butterick 4443 features SIX views, including a 3 bodice variations,trims, belts, all sorts! What they all have in common is a lovely just below-knee length and close fit around he bodice. Views A and B are the Strapless Bodice views, with varying trim. Certainly overtly the Party Dresses of the pack, I can see these at weddings and most certainly in Woven Stretch Jacquard Dress Fabric Gold. The high cotton content of this Jacquard make it fit with this pattern well, and would hold structure of the skirt well. Perfect for the simplicity of View A with it's Baroque Patterned Texture. It also has Lycra so will give and take with all the dancing (or expanding stomachs) of the up and coming season! I'd swap the Black for a lovely Navy for a slightly more gentle contrast. View F is the lovely Sunny Day dress with the gorgeous sleeves. Sirdar Noah's Ark Knit Along Part 2 - Elephants! It's that time again! Expand the menagerie with Pattern #2 of the Noah's Ark Sirdar Knit-a-long! Small amount of black yarn for eyes. cm centimetres, mm millimetres, in inches, M main, C contrast, k knit, p purl, inc increase, psso pass slipped stitch over, rem remain, rep repeat, sts stitches, s1 slip one stitch knitways, tbl through back of loop, tog together. M1 make 1 stitch - pick up loop between last and next stitch and work into the back of this loop. st-st stocking stitch -1st Row. Knit. 2nd Row. Purl. Rep these 2 rows. Using M cast on 30 sts. Next Row. K2, * m1, k2 rep from * to end. 44 sts. Next and Every Alternate Row. Purl. Next Row. Inc in 1 st st, k20, m1, k2, m1, k19, inc in next st, k1. 48 sts. Next Row. Inc in 1st st, knit to last 2sts, inc in next st, k1. 50 sts. Next Row. Inc in 1st st, k23, m1, k2, m1, k22, inc in next st, k1. 54 sts. Next Row. Inc in 1st st, knit to last 2 sts, inc in next st, k1. 56 sts. Work 13 rows without shaping. Next Row. K25, k2togtbl, k2, k2tog, k25. 54 sts. Work 3 rows without shaping. Rep last 4 rows 3 times more. 48 sts. Work 4 rows without shaping. Next Row. (K2tog) 24 times. 24 sts. Next Row. (P2tog) 12 times. 12 sts. Break off yarn and thread through rem sts and fasten off. Using M cast on 25 sts. Next Row. K11, m1, k3, m1, k11. 27 sts. Next Row. K11, m1, k5, m1, k11. 29 sts. Next Row. K11, m1, k7, m1, k11. 31 sts. Next Row. K11, m1, k9, m1, k11. 33 sts. Next Row. K11, m1, k11, m1, k11. 35 sts. Next Row. K11, m1, k13, m1, k11. 37 sts. Next Row. K11, m1, k15, m1, k11. 39 sts. Next Row. Purl. Work 8 rows without shaping, placing a marker at each end of last row. Next Row. K2tog, k16, s1, k2tog, psso, k16, k2tog. 35 sts. Next Row. P2tog, purl to last 2 sts, p2tog. 33 sts. Next Row. K2tog, knit to last 2 sts, k2tog. 31 sts. Rep last 2 rows 3 times more.19 sts. Work 7 rows without shaping. Next Row. K2tog, knit to last 2 sts, k2tog. 17 sts. Work 5 rows without shaping. Next Row. K2tog, knit to last 2 sts, k2tog. 15 sts. Work 3 rows without shaping. Break off M and join in C. Knit 2 rows. Next Row. (K2tog) 3 times, k3, (k2tog) 3 times. 11 sts. Next Row. P2tog, purl to last 2 sts, p2tog. 9 sts. Break off yarn and thread through rem sts and fasten off. (Make 4) Using M cast on 16 sts. Work 22 rows in st-st. Break off M and join in C. Knit 2 rows. Next Row. K1, (k2tog) 7 times, k1. 9 sts. Next Row. Purl. Next Row. (K2tog) twice, k1, (k2tog) twice. 5 sts. Break off yarn and thread through rem sts and fasten off. (Make 4 pieces) Using M cast on 12 sts. Next Row. Inc in each st to last st, k1. 23 sts. Work 7 rows without shaping. Next Row. K2tog, knit to last 2 sts, k2tog. 21 sts. Work 3 rows without shaping. Next Row. K2tog, knit to last 2 sts, k2tog. 19 sts. Next Row. Purl. Rep last 2 rows 3 times more. 13 sts. Next Row. (K2tog) 3 times, k1, (k2tog) 3 times. 7 sts. Cast off purlways. Working from given spot diagram (below), using C, randomly Swiss darn each SIRDAR piece with the spots. Join side edges and stuff Back working towards the cast on edge. Fold cast on edge in half and sew edges together. Join side edges of legs and stuff. Sew side edges of trunk and stuff to marker. Fold cast on edge at top of head in half, sew together and stuff. Place open end of head around gathered end of body and sew in place. Sew sides edges of 2 sections of ear, together leaving cast on edge open. Sew ears approximately 7 stitches back from head shaping, leaving a 2cm, (¾in) gap between ears. Using black yarn work a French knot with a straight stitch to each side for eyes. My name is Victoria and I’m a 20-something gal from Pennsylvania where I live with my husband, Josh and our dog, Brinkley. I blog over at Very Blissful. It’s my place where I share my handmade makes, from sewing to papercrafts to home DIYs (and everything in between). I’ve been blogging for as long as I can remember, but this is the first blog that I’ve consistently kept up with. I can’t even remember when I started crafting it’s been so long! If I really think about it, I was probably in high school when I first started scrapbooking with my mom. She’s the one who got me into everything I love. She taught me how to sew, knit and be creative--she’s definitely a huge inspiration in my life! That is such a hard question because I have a LOT of crafts I love, but I would have to say it’s a tie between sewing and cardmaking. I love sewing my own clothes because it allows me to be creative and still stay on trend (and on budget). Card making gives me the ability to make other people smile. I love to make cards for coworkers, family and friends, and I’m always find new ideas to create something that stands out. You can do anything with crafting, and you can do it yourself. I often times find myself in a department store thinking “why spend $$$ on this cardigan/card/scarf when I can make it?” That kind of thinking opens up a world of possibilities for me! Yes! My mom and I love to spend time creating cards when we are together. We also both love to knit/crochet, and if we are sitting with our family watching a movie we usually have a project in hand, too. Selfishly I sew a lot for myself, but I’ve made it my goal to start making things (other than cards) for other people. I have a couple projects and ideas to create something for my husband in the next few months. I stumbled upon the sewing blogosphere randomly one day back in 2012, and I’ve really never looked back. After reading a lot of what other sewists were sharing about the craft I decided that I wanted an outlet to do the same, too. My ultimate motivation is just to inspire others to know that they can create anything they want. Anyone can be a crafter! I don’t really snack while I’m sewing or crafting, but I always have water or tea on hand. My Gingher shears for cutting fabric, my iron and my iPad. I sew a lot of PDF patterns, and I keep all of the instructions on Google Drive and read them from my tablet. Knits are my ultimate favorite! I didn’t start out sewing with them though--there used to be such a stigma about sewing with knits. But they are so quick, so forgiving and I just can’t stop! I try to sew one thing at a time. I do have about 4-5 unfinished projects that just need finishings that I sometimes leave for later if I want to get on to something else. As far as cards go, I make anywhere from one to 10+ at a time. Additionally, I have a lot of knit and crochet projects going on at once. This is a hard one, but I’d have to say my first Out and About Dress by Sew Caroline. It was the project that made me fall in love with sewing knits, and I still wear it over two years later! I’m working on some awesome projects for my Minerva posts...I don’t want to spoil the surprise! Yes. I usually put Netflix on, but the shows/movies vary. Usually I’ll watch Home/DIY shows or an old classic movie while I sew. Nothing too serious that I have to pay attention to! I’m always on my Bloglovin feed and Pinterest for inspiration prior to crafting. I love seeing what other people create and then taking that to create something made by me. Make a mess and clean it up whenever it starts to bother you! How can you create without chaos? I follow a lot of other blogs. You can click here to check out my Bloglovin profile with the blogs I follow! Don’t worry about how much you post. Quality vs. quantity is always better in my mind! Thanks Victoria for sharing your story. Her first post goes live Tuesday 20th October so be sure to check her out! If you can't wait that long, you can get your fill over at Very Blissful. I've already been over, a perfect read! Also, my heart is pining for Brinkley! Well, it's that time of year. It's most certainly Autumn. The winter woolens are slowly and surely coming out of retirement, and the thick tights are sneaking their way into our daily wardrobes. There is hope, though! It's not quite big wooly coat time and this week's POW certainly reflects that! Vogue 9069 is a 'Vogue Very Easy' pattern so is a great starting point for anyone just breaking into coat making. Even the fabrics are there to help you. Designed for fabrics such as Lightweight Woolens, Fleece, and Gabardine (as well as it's sister fabric Gaberchino) they are all relatively easy to sew, particularly the Light Wools which will ease you in genteley for anything heavier you'd like to work with in the future. Even with the introduction of Satin and Taffeta for the contrast, these are small pieces which will give you some insight to future sews (Taffeta is GORGEOUS to work with!). The coat itself is loose fitting, to, so even fitting won't be too much of an issue. As if all that wasn't enough, it's a designer pattern so you know everything will be just so. Looking at the rear pattern information, you'd be forgiven for thinking this is a Dressing Gown pattern! The simple cut of the pattern means you can be brave with your fabric choices as this is really going to be the focus of the piece. I mentioned this fabric in last week's POW but it really bears repeating. Our Camel/Brown Tweed 100% Wool Suiting Designer would really make this coat something special. 100% wool to make it hardy against the strong British Winds, but being a suiting fabric is will be light enough to work with the flow in the pattern. Team this with our Camel Circles Jacquard Patterned Lining and you're onto a winner! You could also go for something slight more mac-like with the Gabers. Our Polycotton Gaberdine would be really easy to care for, and its polyester content would prevent epic creasing when it's draped over your arm in the sporadic Autumn sunshine! The benefit to the staple colours this comes in is you can really play with contrasts. A flash of Cerise Pink Habotai Lining certainly wouldn't go amiss! Now if you really want to go to town, our Gaberchino comes in some truly stunning colours and I'm quite taken with the Turquoise! Mix with a Lemon Yellow Anti Static Lining and you can brighten anyone's rainy October day! If you're looking for a little luxury and want your coat to really take you through into early winter, our Navy Blue Cashmere Wool Coat Fabric is certainly for you. Some say you can't have luxury without a contrast in satin, and our Satin Backed Crepe in navy is the perfect match. Choose from the shimmery satin or the matte crepe side for a truly stunning coat that will be sure to turn heads! Now just when this couldn't get better, for this week this pattern is just £6.50. Six Pounds and Fifty Pence for a designer pattern! Get in my pattern stash! Be sure to share your makes! This pattern is a blank canvas and I want to see what you can paint! Sewists! Crafters! Hear our cry! Now we of course think we should win these titles, but we need to convince you to go back and Vote Minerva! I'm in a very lucky position to be able to work in all the categories we've been nominated in so I'm in the best position to give you some behind the scenes info into why we think we're the best! Well, I'm going to have to try and show you! Our expansion over the last year has been phenomenal. Our gang has expanded to 10 more Team Members, so out with the old packing tables and in with brand spanking new tailored stations! ...and our Yarn department is bursting at the seams! With all this going on Vicki, Daniel, and the Warehouse Team have worked on tailored software to streamline everything to get orders out even faster. Yep, that's right. We've written new software to provide the best service. If you thought we were good last year, you've not seen anything yet! The team behind the screens answering your queries are seasoned crafters living the dream. We're like kids in a candy store, we can't get enough! Researching products isn't our job, it's our passion. We want to know the width of the stripes on the mini-stripe polycotton, and the difference between KnitPro Nova and the Nova Cubics Knitting Needles, and if 28 Gauge Wire is better for earrings than the 20 Gauge . This information is important to us, so we know it's important to you. We sweat Sewing Machine Oil and bleed Glitter because that's what we'd want from our craft supplier, so we do it to be your craft supplier. If you think this means we're the best, Vote Minerva! Well, what can I say about our blog. "The Minerva Blog" is the umbrella that covers our Craft Blog and the Minerva Crafts Blogger Network. Each fantastic in its own right, this community of crafters strive to bring you the most comprehensive 'go-to' on the blogesphere! The Minerva Crafts Blogger Network has expanded to 43 of the finest bloggers from across the world to bring you unbridled inspiration and unparalleled expertise. We've got Knitters, Crocheters, Sewers, Jewellery Makers, Quilters, Homemakers, all sorts! All brimming with excitement at being able to share their passion with you and the online community. Just when you think you know them, they always pull out a showstopper! How can we forget Nicole and her Red Vinyl Valentine Coat?! Or Maria and her Steam Punk Work Wear! Nine shiny new bloggers have joined the fold since March, and it's so exciting to see their work! We've seen Amy return with her best make yet..a son! Plus, we have our first gentleman blogger! Then of course we have our home grown talent on our Craft Blog. 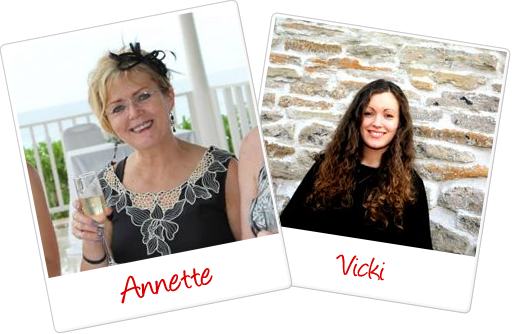 The dynamic duo that is Annette and Vicki! There's no stopping them. Not even a Royal Wedding! I am, of course, referring to the Minerva Royal Couple Vicki and Richard! The lead up to July 4th was a great time around here as the blog was flooded with images of Annette and Vicki sewing up a storm! The only person in the blogesphere who didn't see it was the Groom, Richard, under strict instructions not to sneak a peek at the 4 Bridesmaid's Dresses, Flower Girl's Dress, Mother of the Bride Outfit AND The Wedding Dress, all sewn by Annette's fair hands! Looking back through the blog almost brings me to tears. This is just a snippet! It's been such a great year to have shared, and if you think this means we're the best, Vote Minerva! We're a bit bigger than people think! When we explain we're a Craft Shop based in a small Lancashire town just north of Manchester, people expect a little shop, with a wooden front, in a converted terrace house. Not quite! First, on your right, there's Quilters corner! "How can you fulfil a quilters needs from just one corner?!" Quite simply...we can't! This is just the tip of the Quilting Iceberg. The Shop Staff work closely with the Office and Warehouse teams to display and rotate the vast array of fabrics and accessories from our warehouse to find exactly what our customer desires! Can't see what you need? Just Ask! Our staff are always more than happy to bring anything you require from the warehouse. Carring on to the right wall we have fabrics....lots and lots of fabrics! From Polycotton to Bridal Silk, we have it in abundance! ...lots of yarns and patterns! (this is just chunky and super chunky!) From the chunkiest Scarf Yarn to the finest Lace Yarn we have you covered. On a budget? Try the Big Value! Need something hardy? Premium Acryllic, naturally. Allergic to wool, but want something special? Try the Alpaca! We've got you covered for Knitting Needles and Crochet Hooks, too! From Budget Bamboo to Premium Wood, and everything in between. Then there's Needlework and Crochet Corner! For those who want the finest lace threads, the latest embroidery floss, or the purest white aida! and just plain inspiration we have everything covered at the Minerva Craft Centre, and this is why we think we're the best! If you agree, Vote Minerva! That's right! When you Vote, Sew Magazine enters you into a draw to win £500 worth of sewing goodies! Too good of a chance to miss, right? If you could Vote Minerva and show us your support, it would be the most amazing thing for us as these are awards from the sewing community, voted for by YOU so if we win we know we're on the track to being the best we can be for you crafty lot! Voting is open until Sunday 20th December so be sure to spread the word (with he hashtag #VoteMinerva) and cast your vote! See you soon you crafty lot!